What is 14 pages long instead of 13, is responsible for some 48 new forms and endorsements; including a new declarations page, 8 new endorsements, 31 revised endorsements and 5 withdrawn endorsements? Why, the new PAP effective September 2018! Attend our very fast paced one (1) hour webinar where you will hear about the highlights of the significant (and some not so significant) changes coming to a PAP near you! 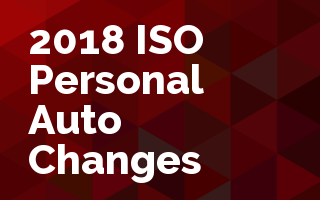 Some of the changes we will discuss include: Newly Acquired Auto changes, new definition added for Transportation Network Platform, and revised exclusions applying to racing & public livery conveyances. What coverages are afforded to a Newly Acquired Auto? What is a Transportation Network Platform? What do the terms racing and public livery conveyance really mean (at least on our insurance policies? Take what you learn in this session and explore how they may impact the policies that you're issuing.